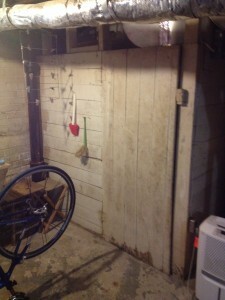 The mysterious wooden enclosure in the basement. My two recent posts on Carter’s Grove and Beverly Wellford’s physician/slave insurance office have gotten me thinking about the experience of inhabiting historic landscapes of slavery as a modern historian and general Yankee. This past weekend, I had another direct encounter with a landscape, not of slavery, but of early 20th century Jim Crow. This final encounter suggested to me that I should make “Landscapes of Slavery” a regular (if occasional) feature on my blog. As transplanted Yankee living below the Mason-Dixon, the remnants of the South’s history of racialized labor relations fascinates me, and I’ll take care to document them as I encounter them in daily life. 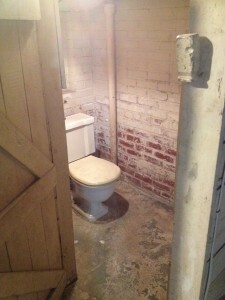 The original toilet behind the rough wooden partition. My latest encounter came while I was visiting my good college friends Fang and Kyle at their new house in Durham, NC. Their house was built in 1940 in a lovely wooded section of town just off of Duke’s campus. Their street was laid out and the houses were originally built for people affiliated with the university, and as such they represent beautifully preserved examples of mid-century professional-class Southern architecture. When they were showing me around upon my arrival, they took me to the basement, where there was a mysterious old wooden partition in one corner, shown above. Behind the partition was a toilet that was clearly original to the house (it is pretty much identical to the original toilet installed in our 1940 house in Fredericksburg), as well as small medicine cabinet and a bare lightbulb. Apparently, upon touring the house the first time, they commented on the spareness of the “basement bathroom,” and their real estate agent told them it was originally the “servant’s bathroom.” “bathroom for ‘The Help. '”* At which point, it made sense: domestic servants in 1940s Durham would have almost certainly been African-American women, and given midcentury Jim Crow’s obsession with separating toilet facilities, it makes perfect sense that an upper-middle-class house built in that period would have had a separate bare-bones toilet in the basement. And I can’t stress enough how bare-bones the facilities were. Maybe when they were newer and cleaner they were more welcoming, but still, the difference in the level of finish between upstairs and downstairs was stark. This led me to wonder about our own contemporary house in Fredericksburg. It too has a bathroom in the basement, although it’s not an original one. At some point, our basement had been turned into a one-bedroom apartment, and the bathroom had been built out into a full bath for the basement resident. (This apartment had subsequently sustained water damage; we’ve torn most of it out, although the gross old bathroom remains as a future project.) It hadn’t occurred to me that the basement bathroom had ever had another purpose besides serving that basement apartment, but I wonder, did our house originally have its own Jim Crow facilities in the basement? * corrected by Fang, and rightfully so, because it’s way better this way. I’m sorry I didn’t give their real estate agent credit for the subtlety of his reference.